The KEE patented Dual Mode Processor called the Triton Aerator/Mixer is new technology that overcomes the previous limitations of oxidation ditch technology and can be used to revitalise existing oxidation ditches and technology. Oxidation ditch technology is one of the oldest ways of treating wastewater. Whilst it enables wastewater to be treated to a high standard, including nitrification and denitrification, it does have significant limitations. 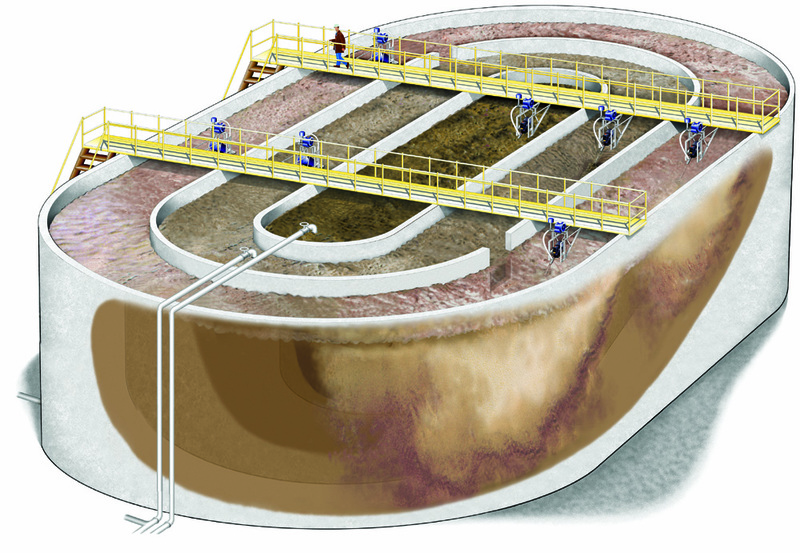 The process requires aerated and mixed liquor to continuously move through the aeration ditch. Brush rotors and disc rotors aerate and mix the liquor but, because they can only maintain the necessary fluid velocity of 0.3 – 0.4 m/s in a shallow depth of no more than 2m, the footprint area of the oxidation ditch is extremely large. The KEE Triton Aerator and Mixer Aerator is an energy efficient, dual mode (aeration and mixing) process aerator that is capable of nitrification and denitrification all in one unit. With two propellers and a regenerative blower, it is able to operate either as an anoxic mixer with the blower turned off, or a very efficient aerator/mixer with the blower turned on. With its two mixing propellers, the Triton is able to achieve significant velocities in depths of up to 10m. This means the oxidation ditch basin can now be built up to 10m deep, therefore significantly reducing the footprint area. The Triton Aerator/Mixer’s primary and secondary propellers inject air bubbles (defined by the Environmental Protection Agency as “fine bubble”) into a high velocity stream (plume) below the surface of the water and provide flow linkage mixing in multiple unit arrangements. Oxidation Ditch with Nitrification, Denitrification and Aerobic Sludge Digestion. Franklin’s plant has two oxidation ditch systems operating in parallel, each of which treats 4536 m³/day, with influent BOD of 185 mg/l and TSS of 90 mg/l. 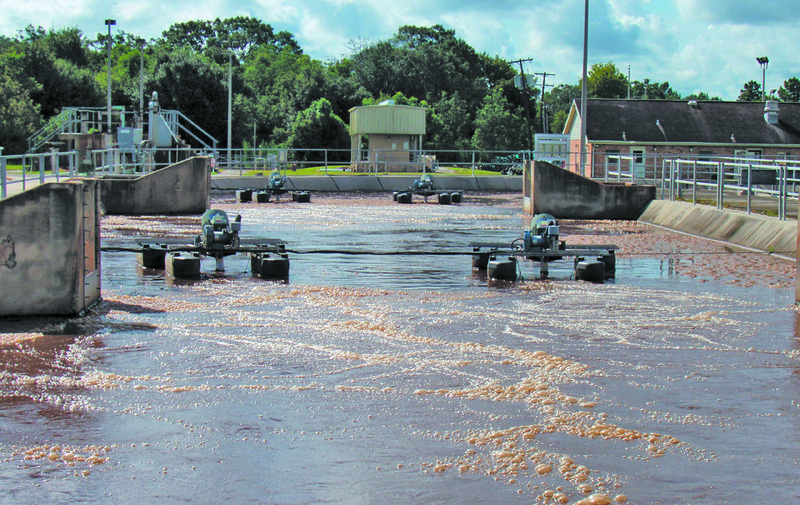 The Oxidation Ditch Wastewater Treatment Plant at Franklin was failing to meet the consent of 15mg/l BOD and 23 mg/l TSS. Because the rotors required daily lubrication, maintaining them was a time consuming and costly exercise. So when the rotors fractured and failed four years ago, the decision was made to upgrade the plant by replacing the brush rotors with the Triton Aerator/Mixer. an effluent BOD of 2 to 3mg/l. During the upgrade each ditch was fitted with four Triton each rated 18.6 kW. This represents a maximum of just over 2 kWh of electrical energy per kg of BOD or 0.4 kWh/m³ flow. The final effluent quality from the refurbished oxidation ditch is testimony to the excellence of the Triton. The result of the upgrade was final effluent with BOD of between 2 and 3 mg/l and TSS well below 15 mg/l. Independent velocity measurements at extremities are well above the minimum 0.3 m/sec, therefore guaranteeing that no solids deposit would develop in the basin. At the same time, maintenance requirements have been substantially reduced to a simple lubrication task once every six months. Oxidation Ditch with Nitrification, Denitrification and Aerobic Sludge Digestion. The Triton with its two mixing propellers is able to to achieve significant velocities in depths of up to 10m. This means the oxidation ditch basin can now be built up to 10m deep, therefore significantly reducing the footprint area. Alternatively, if the rotors are still in good working order but the plant is failing to meet treatment objectives due to lack of dissolved oxygen and/or mixing of the oxidation ditch aerators, Triton can be used in conjunction with the rotors to improve dissolved oxygen levels and mixing. This entry was posted in Uncategorized and tagged desludging, grease separation, Package Pumping Station, packaged waste water, pump equipment repairs, pump repairs, pumping equipment, pumping equipment maintenance, pumping maintenance, pumping station service, Rotating Biological Contactor (RBC), septic tank repairs, sewage plant operation, sewage plant service, sewage plant servicing, sewage treatment plant maintenance, sewage treatment plants, sewage treatment repairs, wastewater treatment, wastewater treatment equipment, wastewater treatment plants, wastewater treatment solutions, Water Pumps Repairs on September 14, 2016 by Connellmarketing1234. Biological Tertiary Filter Units for BOD, Suspended Solids, Ammoniacal and or Total Nitrogen reduction. KEE have introduced a new range of tertiary filter units to their wastewater technology called KEE NuTech Tertiary Filters. The new range of KEE NuTech Tertiary Filter units are a multistage biological – physical system and operates with minimal maintenance and does not require electrical power for its operation, except for specific circumstances. The tertiary filter polishes the final effluent from the final settlement stage of a treatment plant and the polished effluent can be discharged through a UV light disinfection system to make it suitable for irrigation use. The media is contained in easy to handle bags and these bags are arranged to optimise the breakdown of the organic components of wastewater by alternating aerobic and anoxic stages. The aerobic layers of media are aerated through natural ventilation using ventilation stacks and vent pipes or can be low pressure, low power, fan assisted through forced ventilation. 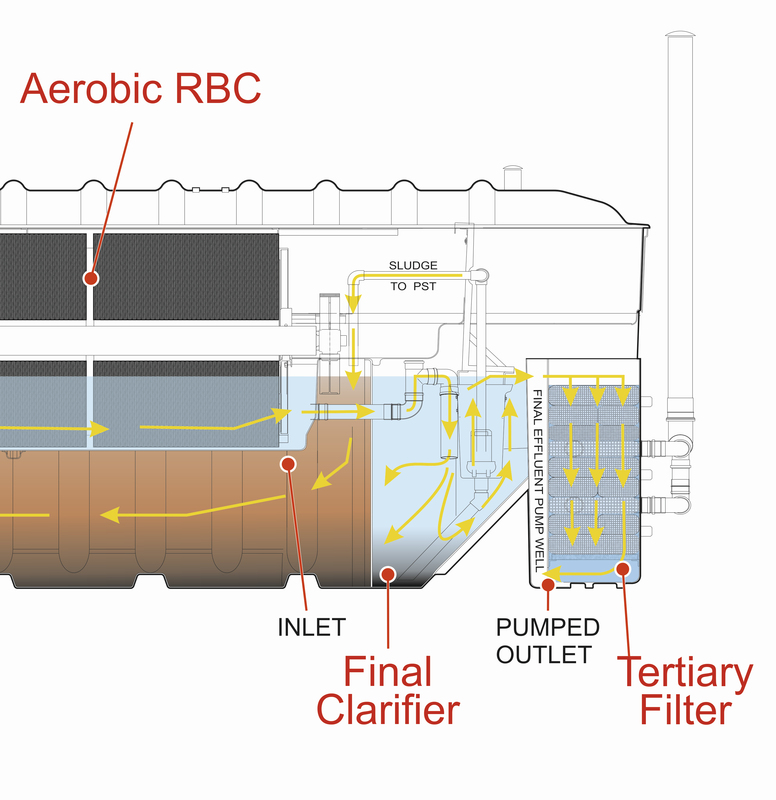 The bio-degradation capability of the tertiary filter eliminates the need to backwash the filter on a regular basis. The tertiary filter media therefore provides the physical separation of the fine solids and the environment for the natural bio-degradation of these retained solids. Tertiary Filter Options The KEE NuTech Tertiary filters are available as free standing units or as an integral part of a KEE Packaged Plant. KEE NuDisc® HR-R Packaged WwT Plant is a simple low energy, low maintenance system, offering the lowest lifetime cost compared to most similar packaged plants for high quality effluent in the market. 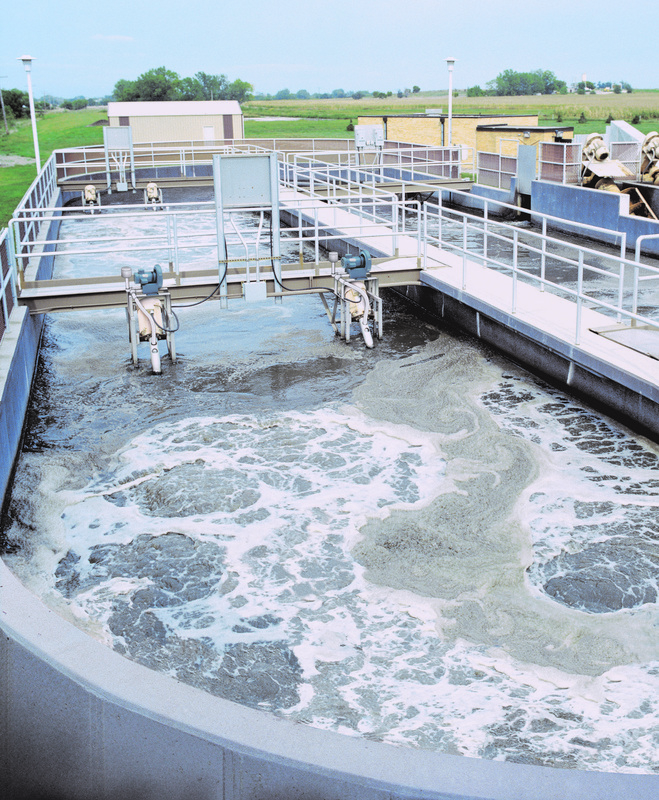 The treated effluent can be recycled for irrigation, general outdoor washing, toilet flushing or similar non-potable use. This entry was posted in KEE NuTech Tertiary Filters, Uncategorized, Wastewater Plant Operation, Wastewater Treatment Plant Refurbishment, Wastewater Treatment Plant Servicing and Maintenance, Wastewater Treatment Process Technologies and tagged desludging, grease separation, Package Pumping Station, packaged waste water, pump equipment repairs, pump repairs, pumping equipment, pumping equipment maintenance, pumping maintenance, pumping station service, Rotating Biological Contactor (RBC), septic tank repairs, sewage plant operation, sewage plant service, sewage plant servicing, sewage treatment plant maintenance, sewage treatment plants, sewage treatment repairs, wastewater treatment, wastewater treatment equipment, wastewater treatment plants, wastewater treatment solutions, Water Pumps Repairs on August 23, 2016 by Connellmarketing1234. KEE EnviroSAF – FINE BUBBLE AERATION with easy access membrane diffusers, meaning no treatment down-time. KEE offer another revolutionary fixed film technology using compressed air. Traditionally, SAF systems with structured media have been offered with fine bubble membrane diffusers, with the drawback that access to diffusers was difficult. Until now it has been necessary to remove media and empty the reactor tank of wastewater to access the fine bubble membrane diffusers. KEE have patented new technology, making it possible to access the fine bubble membrane diffusers without the need of emptying the SAF tank, or removal of the media. Whilst one set of fine bubble membrane diffusers is being maintained the rest of the SAF plant can continue to function and treat the wastewater. This negates the need to empty or hire a temporary plant while maintenance is being carried out. KEE have installed 2500 PE SAF Systems in Scandinavia using this new EnviroSAF technology and also have built plants for UK Water plc.. The KEE EnviroSAF uses patented structured media which has a profile in its shape to induce velocity and pressure gradients in the air/water mixture flowing through the media. This concept enhances mixing and is responsible for keeping the biomass film on the media active and aerobic. 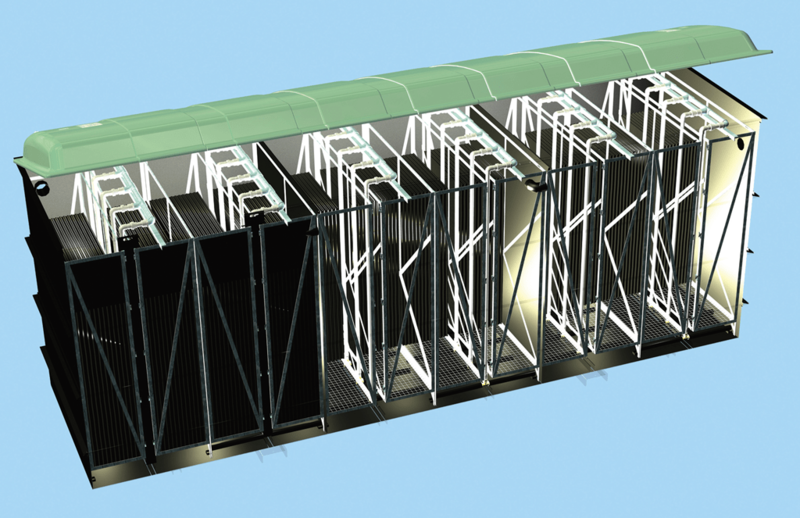 KEE have offered SAF Systems for many years and have built100’s of containerised mobile plants for Work and Army Camps, where the systems were designed to be above ground as they needed to be mobile. Access to diffusers was therefore easy. KEE have also installed SAF Systems in Northern Ireland where the final effluent quality achieved is extremely high, with BOD less than 4mg/litre, ammoniacal nitrogen less than 2mg/litre, phosphorus less than 4mg/litre and suspended solids less than 10mg/litre. 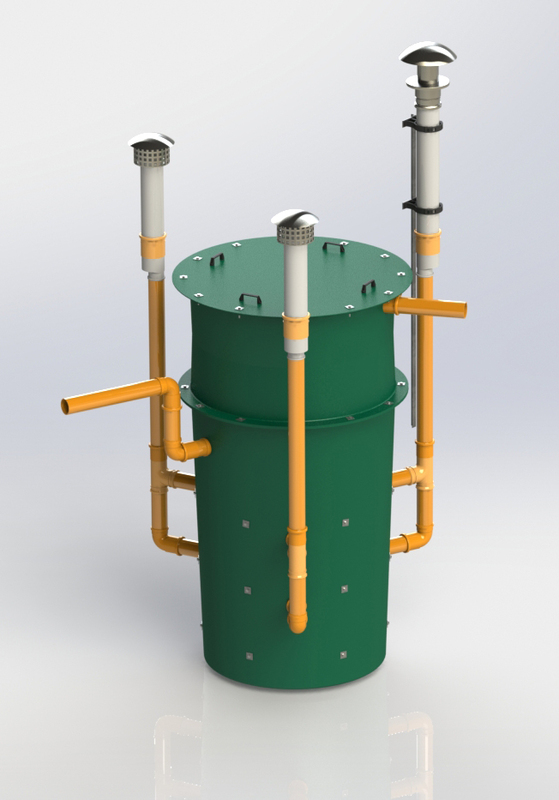 The EnviroSAF technology offers all the process stability of fixed film reactors, but with the added advantage of using fine bubble diffused air, patented structured PVC media and the ease of access for maintenance of diffusers without the need to remove the media and emptying the EnviroSAF tank. The KEE Group of Companies is committed to providing a customised approach to domestic, commercial and industrial wastewater treatment applications. With over 60 years’ experience in the development, design and manufacture of equipment, KEE has installed more than 350,000 solutions worldwide. This entry was posted in Desludging and Jetting Services, Fine Bubble Aeration, KEE Aeration Systems, Uncategorized, Wastewater Plant Operation, Wastewater Treatment Plant Refurbishment, Wastewater Treatment Plant Servicing and Maintenance, Wastewater Treatment Process Technologies and tagged desludging, grease separation, Package Pumping Station, packaged waste water, pump equipment repairs, pump repairs, pumping equipment, pumping equipment maintenance, pumping maintenance, pumping station service, Rotating Biological Contactor (RBC), septic tank repairs, sewage plant operation, sewage plant service, sewage plant servicing, sewage treatment plant maintenance, sewage treatment plants, sewage treatment repairs, wastewater treatment, wastewater treatment equipment, wastewater treatment plants, wastewater treatment solutions, Water Pumps Repairs on June 16, 2016 by Connellmarketing1234.